Game where the players are not allowed to handle the puck. Player must skate to open ice with the puck and teammates have to get open for a pass and give close support. Players must have loose shoulders to control the puck on either the backhand or forehand side of the stick. Players must protect the puck with their body. The game is the greatest coach. 1. Play full ice with teams of 3-3 up to half the team on each side. 2. Players can only touch the puck twice. 3. First touch is when they take a pass. 4. Second pass is when they make a pass or take a shot. 5. Coach blow the whistle if there is more touches and the other team gets the puck. 6. Play a game and keep score. 7. After a goal the scoring team must tag up at the red line before they can forecheck. * This is a game played all the time in Czech Republic and all over Europe. * This is a core game to practice puck support and puck protection. * Batchko is great for any level from kid’s to pro and can also be a SAG. Puck carrier must use escape moves to create time and space and teammates must skate to get open so no one is blocking the passing lane. Give a target and keep the stick square to the puck to catch the pass. Stop them to teach correct technique. 1. Play keepaway in an area of the ice and each game has one Joker who is always on offense. 2. Earn one point for making 5 consecutive passes and keep score. 3. This example has one game of 3-3 + 1 and the other 4-4 + 1 at one end and neutral zone. 4. Great activity to practice puck support and goalie practice. 5. Introduce modified rules such as Botchko, only backhand passes, only forehand, must make and escape move, one touch, saucer passes, only skate backwards, etc..
6. I used a green pinnie that is easy to put on and take off. I watched highlights of Ovechkin scoring two goals the other night and the moves he used are right out of this sequence he learned from his former coach in Russia. The first goal he faked a shot then pushed the puck outside the defenders shin pads on his forehand, shot and scored. Next goal he did the same but added pull across and slide backwards - shoot - Score. Vladimir Jursinov has developed over 65 players who moved on to the NHL. He coached Moscow Dynamo during the Soviet era and was assistant to Tikonov when they dominated the Olympics and World Championships. In 98 the first time NHLer’s played in the Olympics the Russian players who were in the NHL insisted he be the head coach for the Olympic team or they wouldn’t play. He has coached other Olympics since. This is a 1-1 sequence that gives options to score. I was lucky enough to coach with Jursi in Austria and took video so I would remember what he did. Use all of the options. Shoot to score, shoot for a rebound, one pass, two passes and learn to be a threat. Make the first pass early so there is a second play. Shoot to score and follow the shot for a rebound. Player without the puck go hard to the net and give a target with the stick. Both players stop at the net. 1. Shoot for Rebound – two players leave from the middle, skate hard to the net with the puck and shoot low to the far pad for a rebound. The second player go hard to the net for a rebound with stick on the ice and controlled skating. Start shooting at one end and then shoot at both ends. 2. Play Poker with the Goalie. Players can now either shoot or pass. 3. Early Pass then Poker. Pass high in the slot and then play poker with the goalie and either shoot or make a second pass. 4. Add a defender and play 2-1. The last attacker out of the zone defend vs. the next two attackers. Wally Kozak's Youtube hockey link. Defense make a deception escape move to beat the forechecker and face up ice. Skate hard and pass while skating. 1. Begin with a stop and start skating progression where you face the puck with no cross-over but load on the back inside edge and push forwards with the stick as a target. 2. Goalies make a breakout pass to each side. All the skaters go deep in the corner and pivot for a pass from each corner. 3. First player carry the puck and make a fake inside turn outside, skate hard and make a pass to the second player skating up to boards. Pass to the goalie, open pivot and get a return pass. Progress to forward pass to the goalie who passes to the defense. 4. Three leave, one defense, two wing, three centre. Centre support low and slow from behind and below the wing. Goalies move to the red line and exchange passes. Add pass back to D who passes to the other forward. 5. Four leave and the fourth player is a forechecker. Checker cover either the wing or centre and defense read the passing option or pressure the puck carrier. 6. Attack 3-1 backchecker and score at the other end. 7. Pass to Goalie. Goalie Set up Puck. Breakout 3-0. Attack 3-0. Defense start at the blue line and forward shoot the puck on net. Goalie set it up and breakout and attack 3-0. Defense skate backward, pivot forward, shoulder check. Defense make an escape move to beat the checker, skate hard up ice and pass to a forward. 3-0 attack with speed. D join the attack. https://youtu.be/995uo789DdY (I fixed the video so the title only comes on once. Roll the puck from the heel of the stick to the middle with the hands away from the body in a motion similar to throwing a frizbee. Follow through at the target. Do the same motion on the backhand. 1. Partners line up opposite each other on the blue line. 2. Start with stationary passing and focus on the mechanics of the saucer pass. 3. Pass with a target and practice landing the puck on the red line. 4. Practice both forehand and backhand saucer passes. 5. Progress to skating back to the top of the circle, forward and pass from the blue. 6. Add pivots and fakes. 7. Have contests on how many land on the red line. Shoot while skating. Hit the net. Use deception to get the shot through. 1. Defense skate and get a puck on the boards, skate inside the dot and shoot x 3. Do this on both sides. 2. D1 skate out and pass to D2 at point, then go out to block the shot. D2 make deceptive moves to get the shot on net and miss the blocker. 3. F1 leave from behind the red line at a coach or other player. Skate to the inside and wait for defender to collapse to protect the middle. Skate outside, build a wall with the leg and body and puck on outside. Cut in and shoot. 4. Scissors. F1 skate up the boards with a puck. D1 read F1 is above the hash and shouldn’t pass to the point and skate down the wall. F1 leave room for D1 to skate down the boards and pass to D1. D1 go to the net and F1 cycle high for a pass. Practice to develop power play skills. Lots of ideas from Wally Kozak. 1. Go to the net. 2. Pass to the left winger. 3. Pass to Kurri for a one timer. 4. Pass to Coffey coming in from the point. 5. Pass to the strong side D.
It worked pretty good for all of them. When the defenders are using a contain forecheck and are ahead of the puck you cannot beat them skating in straight lines. You must continually isolate the wide player and create 2 on 1 situations. Support by taking the ice behind the puck carrier. 1. Practice with a 2 on 2 situation and isolate a defender by crossing. a. Cross drop and #1 screen weak side D.
b. Cross, drop 1 to net, 2 wide. c. Cross and fake drop. 1 through middle 2 go to the net. Create 3 on 3 situations in drills and games. d. #’s 2 and 3 go hard to the net. e. #1 go to the middle and shoot or pass. * Other options are another cross behind or pass back to the 4th and 5th supporting attackers. Important is to change the speed and angle of the attack and force defensive decisions like switch or stay man to man. Examples from Pro team practices. Protect the puck and go to the net and use give and goes, screens, picks on offense. Play tight gaps with body on body and stick on the puck from the net side and communicate playing man on man or switch on defense. Keep score and play to a score or time limit. Modified rules can be added. Various situations can be created by playing 3-3 or uneven situations like 2 on 3. 1. Play cross ice with the extra players waiting at the blue line and coach has pucks to keep play going. 2. Nets can either be against the boards or out far enough for players to go behind the net. 3. Divide the ice in half with paint or the coach is in the middle at the blue line as a guide. 4. Play 2-2 at one end with 2 players from the defensive team waiting to attack at the other end. 5. Defenders pass the puck to up teammates who attack the other net. 6. Original attackers back track and play defense vs. the new attackers. 7. Coach pass to the offensive team after a goal. 8. New defenders come in after the breakout pass is made. Battle for loose pucks. Fire in a new puck as soon as the battle is over. Start with one end and then go both ends at once. Keep score. Stop the battles and ask what can be done better and give input to improve performance. Check closely and pressure the puck carriers hips. Can be played 1-1 to 5-5 with even or odd numbered teams depending on how many players are practicing. 1. Players line up on the red line. 2. Red one side and black the other side. 3. Battle for pucks with good angles, body position, protect the puck. 4. Coach shoot a puck in and a player from each colour race for the puck. 6. Player that wins the battle must breakout over the blue line then turn back to attack. 7. Battle happens at both ends. 8. When the rush ends players return to the lineup and a new puck is shot in at either end. 9. Play 2 on 2. 10. 2-2 has all 4 game playing roles. 1-puck carrier, 2-offesive support, 3-closest checker, 4-defend away from the puck. 11. Start at one end to demonstrate and then go both ends at once. When defending the player needs to eliminate unneeded cross-over’s and extra steps. The toe caps must face the puck carrier so the defender is able to skate and turn left-right-back-forward to maintain a tight gap and the defensive side. This skill is important for all the player including forwards. 1. Defensemen work with the coach at one end of the rink. 2. Skate forward then do a one foot stop and load with the other leg. 3. Push with the back leg and stride with the front leg without a cross-over. 4. Do two short reps facing one way using this load a fire technique. 5. Introduce the one foot and two foot controlled skating. 6. Alternate right skate, left skate, two skate control skating on coaches signal. 7. Full speed and stop on coach command, right, left, both. 8. Skate forward, one foot stop then backward without crossing over. 9. Skate forward, one foot slide, forward again then backward. 10. Skate forward to backward using a one foot stop and stride only – both ways. 11. Alternate skating forward to backward using the right then the left foot pivot. 12. Go full speed x 2 from the red to blue and back to red line. List of the drills with links to the description, diagram, video demonstration. Jursi was the assistant coach for Tikonov with the great Soviet teams. The Russian players insisted he be the coach for the 1998 Olympic team or they wouldn't play. It was the first time NHL players participated in the Olympics. He has coached another Olympic team since, I think 2006. Jursi came one week a month to do skills and mentor the coaches when I was working for the Red Bulls in the 2008-09 season. In these drills the focus in on big moves, hard fakes and handling the puck all around the body. Yashin is in a lot of the video and this is when he was MVP in the NHL and captain of Russia. Koivu is the player in green where him and Yashin are demonstrating the skills. A200 Russian Olympic Coach Teaches Puck Handling - This is a video I too when Jursi was in Salzburg working with my U17-U20 morning skills groups. One pdf has Yashin demonstrating at a hockey school run by Juhani Wahlsten and Jursinov and the other outlines the various moves you can do. Defenders collapse low in the zone. Create 2 on 1's by attacking the widest defender on the 2-2 rush and use crosses, drops and picks. Add competition by keeping score and timing the game or play to a certain score like first team to 3 goals. 1. Extra forwards and defense line up on the sides in the neutral zone. 2. Start with a 2 on 1 attack Blue F1 and F2 vs Red D1. 3. When the puck crosses red line red F1 and F2 tag up at far blue and backcheck. 4. Blue D1 support rush from the point. 5. Play 3-3 at each end. New players go the other way. * In the 2-2 to 4-4 game two defending forwards tag up and backtrack between the dots to the mid slot and then cover the points. D1 and D2 play low against F1 and F2. * You can play this transition game from 1-1 to 3-2, i.e. 1-1 gives a 2-2 at each end, 3-2 gives a 5-5. Puck carrier must protect the puck and use fakes and deceptive skating to get to the dot. Defender must use defensive skating skills keeping the toe caps facing the attacker, hands down and block the attacker. 1. Attacker carries a puck and defender has no stick with hands close to chest to block attacker. 2. Start at one circle to demonstrate and then use multiple circles with a coach at each one. 3. Go for 10-15” and switch competitors. 5. Break the team into small groups and do the same drill in multiple circles. Great transition game to practice offensive and defensive 3-3 or any other numerical situation. Defend from the net side; closest on puck carrier, second closest one stick length away, third closest halfway. Defenders indentify who you cover early. Create 2-1’s on offense and fight for the inside position. Attackers pass behind to the other side to spread the defense and create seams. Dump-ins can be added to work on the forecheck and breakout. This game can be played in situations 1-1 to 5-5. 1. Players line up behind the red line. 2. Defenders allow the attackers to pass and start the new attack in the neutral zone. 3. Start with 3 reds attacking vs. 3 blacks. 4. On a goal, frozen puck or turnover the defenders must carry the puck over the blue line. 5. Black defenders pass to team-mates waiting at the red line. 6. Original attacking reds now defend inside the offensive zone. 7. This game can be done at one or both ends. 8. Blacks must get onside before the new attackers can cross the blue line or reds get the puck. *Keep score and have tournaments with 4 teams and a game at each end. Attack with speed and defend with tight gaps. Add regroups. Vary the number of attackers and defenders. 1. Attackers and defenders are in corners at each end. 2. F1 skate across the top of the circle and get a pass from D2 who follows. 3. D1 defend the 1-1 attack. 4. F2 leave from the other end when the original attack passes the top of the circle. 5. F2 get a pass from D3 and attack vs. D1and D3 follow the attack. 6. Two or three forwards can attack vs. one or two defenders. 7. Add F2 regroup with D3 in the neutral zone. 8. Another variation is regroup only if the coach blows a whistle. 9. Possible situations, 1-1, 2-1, 1-2, 2-2, 3-1, 3-2. This is a Small Area Game where the players must pass to a Joker behind either net to go onto offense. There is constant transition in game playing situation; loose puck, offense, defense and game playing roles; puck carrier, puck support, closest checker, cover away from the puck. 1. Play 2-2 with a Joker from each team behind each net. 2. You must pass to either Joker before you can score. 3. Jokers can shoot, pass to a player or to the other Joker. 4. If there are extra players rotate to Joker, Player, Rest. 5. You can play from 1-1 to 5-5. 6. Option is half the players play and half are Jokers and each has a partner who they rotate on their own with. 7. Modified rules like only 2” with the puck or goals must be on One Timer Shots are a good way to practice game playing skills. Battle for loose pucks, screen the goalie, shot passes, cycle, man on man, tie up sticks, tip, low zone play. Keep score and play from 1-1, 1-2, 2-2, 2-3, 3-3 low in the zone. 1. Line up with the face-off dots and 1 to 3 players race for a loose puck the coach shoots in. 2. Pass to the point to transition to offense. 3. Point player must shoot or pass within 2 seconds and plays low on the next coach shoot in. 4. Play 30’ shifts and pass to the coach on the whistle. 5. If a point pass goes out the other point-man gets the puck. *Players must race to get onside before the next puck is shot in. *Players at the point can pass or shoot but they can’t go in. *Keep score and add rules like goals must be on one touch shots, or give and go plays, etc..
*This is the favorite game for some of the pro players I have coached over the years. *Coach can use this game to teach many things on both O and D. Here coach teaches attackers to support player at the point by being in a position to screen, one time or redirect a shot pass. Most offensive and defensive principles can be practiced with this game. Defense line up in the Nzone on one side and forwards on the other side. Defense join the attack and the forward must backtrack and communicate with his defenseman who to cover in the defensive zone. One puck, zero whistles. Game not a drill so regroup on dump outs. Coaches talk to players when they come back to line up. Keep score. Progression from drill of 1-1 and support at other end on whistle. Options are to play 2-1 or send out 1 or 2 F or other combinations. 1. Red F1 attack 1-1 vs. the Black D1. 2. Red D1 follow the play when puck crosses red line and support from the point. 3. Black F2 tag up at the far blue line and backtrack through the middle lane. 4. On turnover, frozen puck or goal Black D1 pass to Black F2 and join the rush. 5. Black F2 attack Red D1 and Red F1 backtrack to cover Black D1. 6. Black D2 follow and support the attack from the point. 7. Red F3 tag up and backtrack between the dots and cover Black D2 at the point. 8. Play 3-3 in the zone. 9. Breakout with Red F3 attacking Black D2. 10. Red D1 join the rush and Black F2 backtrack. I have put the PDF's of the drills posted so far in folders on my One Drive.They are organized according to our coding system to make them easier to find. The first letter tells what the topic is and the number tells where on the ice the drill or game happens followed by the player level. i.e. B600 means it is an unopposed partner or team skill starting at the four blue lines. The drill is named and the group like Czech U20 tells which team is demonstrating. There is a search function in One Drive. T - Coach is teaching the activity. T1 - Individual Offensive Skills. Practice the stationary slap shot then slap shot while skating. Work on taking one timers while moving, Pass within the puck handling motion using a wrist pass both forehand and backhand. 1. Goalies work with the coach at one end. 2. Take stationary slap shots then take turns taking 4 one timers. 3.	Review rolling the wrist stickhandling then wrist pass within the motion with no noise. 4. Skate around the line up with a puck and shoot on the empty net from the top of circles. Stride backward with no cross overs at the start. Close the gap on a regroup. Use front to back arm action to help accelerate. Sit tall, head up, ride a horse. 1. Forwards in the corners and defense in the middle at one end. 2. 2 on 2 rush with the defense striding only skating backwards. 3. Forwards focus on speed and take a shot from the outside. 4. Forward start from the goal line and defense from the dot. 5. Come back through the middle lane. 6. Defense skate back between the dots and protect the middle. 7. All defense backward stride and focus on the north-south arm action. 8. On whistle forwards regroup and defense keep a tight gap protecting the middle. Defender must approach with toe caps facing the attacker using controlled skating. Always defend from the net side and a tight gap. Lead with the stick and use contact to restrict the attackers options. 1. Practice using the inside edges of both skates and then one skate at a time. 2. Go on ‘green’ and stop on ‘red’. 3. Practice moving all directions facing the attacker with the toe caps forward. 4. Skate sideways without crossing the legs. 5. Stay square to the attacker always staying on the defensive side. 6. Alternate stepping once each way and then twice each way. 7. Skate all four directions; forward, backward laterally each way. 8. All the players mirror the demonstrator. 9. Mirror partner, start slow and go fast on the whistle taking turns. 10. Everyone get a partner and alternate mirroring each other. 11. Mirror in all directions. Defenseman has to keep skating up ice with the puck or the forecheckers know your only option is to pass. Skate between the dots with the puck so you have many options. Skate up ice as long as you can to drive the forecheckers off the blue line into the neutral zone. To beat a checker skate in a 45 degree angle to the inside and then tight turn to the outside. 1. Goalie place the puck so the defenseman can either go behind or make a tight turn outside. 2. Start from the top of the circle with one player at the point to shoot and one screen goalie. 3. Coach pass to the goalie who places the puck for a defenseman to pick up. 4. Defense skate to the puck and ‘wheel’ behind the net and cut up ice near the post. 5. Skate between the dots to the top of the circle and pass to the point who shoots. 6. Sequence is breakout, shoot, screen then back to lineup. 7. Defenseman skate to the back of the net at a 45 degree angle then tight turn to the outside. 8. Make the forechecker x-over and then tight turn away from pressure. 9. Counter by drive skating to the back of the net, stop at the far post facing up ice and exit hard. 10. If forechecker comes from the wide side pass puck behind you, protect with your body and exit. 11. One forecheck and the puck carrier must read the rush and either, wheel, tight turn, counter. 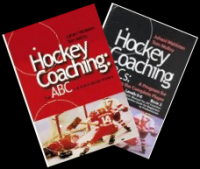 This link takes you to the playlists and all the hockey coaching videos I have posted on Youtube. You can sort them, search or find them in other ways. Great example of pk using the shrink in Major Jr. I think the video on here titled D Zone "Swarming" is a very important concept. We have spent a lot of time and focus on this with my junior team this year on the Penalty kill... we use the term "Shrink" which refers to a deliberate play on the PK when we can pressure the puck but don't have an opportunity to have an immediate clean 200 foot clear. As soon as the puck is stalled all 4 players swarm the puck or as we call it "shrink". What we have taught our players is that if you can't clear the puck stall it with 1 pinning the man in possession of the puck. The 2nd and 3rd PKers immediately move to seal both sides of the battle with the purpose of keeping the puck in the pile.... the PP player will likely be trying to move the puck out either side of the battle so the PK players 2 and 3 just keep pushing the puck back into the pile killing time unless they can get a clean clear (refs seem to be more and more reluctant to blow the whistle on these type of plays). PK player 4 moves in very tight so that when the puck becomes loose he is able to make a hard forehand clear down the ice. I'm attaching a couple of examples of our team using this "shrink" on the PK.... since we started stressing this concept our PK has been much more effective. ABC Hockey Drills on YouTube organized by category and skill. All times are GMT. The time is now 07:50AM.